Many times, we talk about the good ole days but seldom can pinpoint just what and why they were. 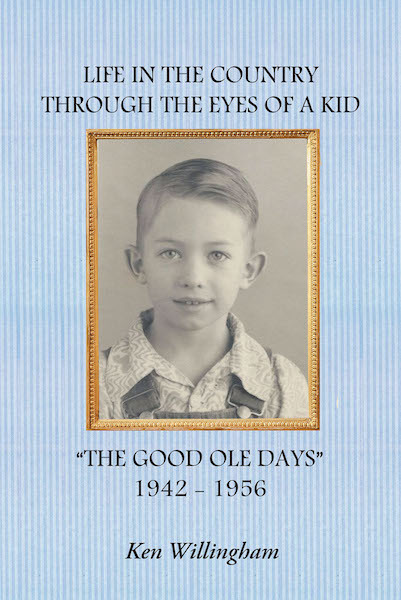 The stories and tales I have written straight from memory goes back to my childhood, beginning at age two, and proceeds through my sixteenth year. I promise you there is absolutely no fiction in these stories. Life on the farm was lived day by day, and nowhere in the universe could you be closer to God. You had to have complete faith, but at the same time, you had to believe in your mother and father as being your leaders, teachers, and protectors. This came about from being lucky enough to be born and raised as a country kid. Born the middle child of sharecropper parents, we lived in rental houses, many of which were close to a hundred years old. Most had no insulation; floors had cracks you could see light through and had single-pane windows that gave little or no protection against the cold. But in all cases, they were where we called home. The sound of wood snapping and popping in the cast iron stove let you know that you were safe and would remain warm throughout the many years and winters that were to come and many that had gone. My parents worked day and night to meet the needs of three children, and all our needs were met without compromise. It was our wants that made us become self-sufficient but never our needs. We did not have electricity in our farmhouse until I was almost twelve years old, so evenings were spent with family in front of a kerosene lamp, and going to bed early was the order of the day. The kids played outdoors the entire day when winter cold and summer heat was a part of our lives. We had chores to do, and working in the garden was expected as part of our entertainment. I cannot imagine how my life could have been any more perfect or my outlook on tomorrow could have been any stronger if I had been born and raised anywhere other than with my parents on the family farm.